There is a common misconception about the hunter that sadly lives in the minds of non-hunting folk. Modern culture conjures up images of beer drinking, cursing, dirty hillbillies stomping around the woods in search of poor defenseless animals to murder in cold blood. Once done befouling Mother Nature, the hooligans return to a lifted truck which is noisy, smelly, smoky and proudly displays a confederate flag in the back window. I personally thank Disney for some of these stereo types, "man has come to the woods!" While I do not dispute the existence of such a person rarely will I classify them in the realm of a true hunter and woodsmen. The fact is that in my experience many hunters spend their days in pursuit of animals because they both respect the animal and honor the bond of hunter and prey. These men and women love the woods as a child loves a park and a jungle gym. They have a connection to the earth and truly experience the cycle of life as they participate in the ancient struggle for existence. True hunters pay tribute to the sacrifice the animal has made and consume the meat to continue on themselves with life. Perhaps I am glorifying the relationship hunters have with the woods and the animals, especially in the modern age of fast food, super markets and instant gratification. Often I am asked why I choose to eat game meat instead of a steak from a local super store. The answer is simple, it is the connection to the meat. I know it, I stalked it, spent time watching it, and then harvested it, later I butchered and preserved it for consumption. People who buy their meat have a distance to it. They do not see the kill, the blood, or get their hands dirty. This is comfortable for them, the meat is just a neat little package on a cooler shelf, there are no feelings or emotions connected to it. For them there is an ignorance that is bliss as it allows them to pretend something did not have to die for them to eat. I do not mean to judge these souls; I know hunting is not for everyone. The fact is if you use animal products in anyway a life had to be taken for you to have that product. The point I am have been working towards is that hunting has taught me many things. A recent hunt brought out a lesson and refined some of my thoughts about work, hunting and life in general. I was hunting with two friends/co-workers. 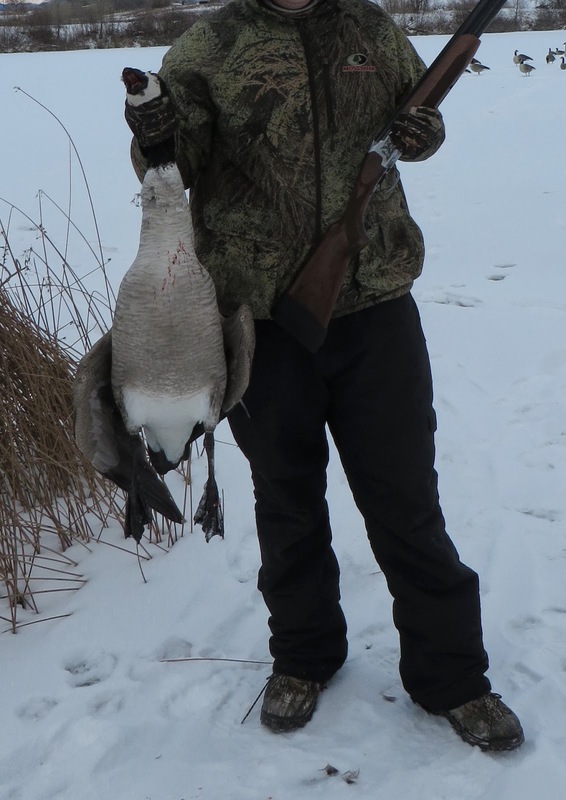 We were goose hunting on a frozen pond at a local state wildlife area. I have always enjoyed ice hunting geese and this hunt was particular memorable as it was the first goose hunt for one of my hunting partners. We set up our decoys on the ice, constructed a makeshift blind out of brush and wood debris and then settled in for some hopeful goose action. The hunt was slow as few birds decided to fly in our area. Several hours into the morning a small flock approached the spread and immediately cupped in. One large goose landed straight away and began strolling through the decoys(dekes). The other five geese flew around the spread and approached for a landing. Three birds dropped in and came within ten feet of landing. It was a perfect opportunity, one bird in the dekes, three birds hanging in midair above them. I was supposed to call the shot for the group so we could all shoot in unison. I did not call for the group to shoot but decided to let the three land in hopes to get the whole group in as there were two more geese circling. The three saw something they did not like and flew off, leaving just the one goose in the decoys. Were able to bag the single and it was my hunting partner's first goose. The rest of the day ended with two more flocks coming to the decoys and six more birds hitting the ice. I kept thinking about the three birds that almost landed and the perfect opportunity that had been missed. Those birds solidified some thoughts about life that I had been having. Take the shot! Every hunter who has spent time in the woods knows there is a time to shoot and time to let the animal walk. However if you spend all your time waiting for the absolute perfect opportunity you will let many good, possibly even great situations pass you by. There is a good enough, the important part is to act on it and make the best out of any situation. As a famous saying state, “You will always miss the shot you never take.” Pull the Trigger! Great hunting, You can buy hunting and camping gear online which helps you to save both time and money and can have different varieties of equipment there.